Helmets cannot prevent bicycle accidents in Hollywood or your community, but they can help you prevent serious brain trauma and can save your life. 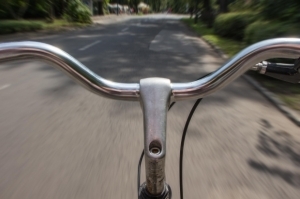 In a bike accident, head injury is one of the most dangerous injuries you can sustain. Without a helmet, there is nothing between you and the pavement if you fall or are thrown from your bicycle. Helmets are designed to absorb impact and prevent this from happening—but they can only work if you wear a helmet correctly each time you ride. Replace helmets after any impact. If you are in a crash or you helmet endures a significant impact or has any dents, it’s time to replace it. Always buy a new helmet; when you buy used, you have no way of knowing whether the helmet has had any impact which could affect its efficiency. Update your child’s helmet as your child grows. Children grow fast, so you need to keep an eye on their helmet to ensure it continues to be a good fit. Always wear a helmet, no matter how “safe” or short the trip. It doesn’t matter how close you are to home or how familiar your route; bicycle accidents can happen at any time. Buy the right size of helmet. Look for the smallest shell size to make your helmet fit. Do not use pads to “make” your helmet fit. If you need help, visit a bicycle shop and ask for assistance to get the correct helmet. Fit your helmet correctly on the top of the head (not tipped back). There should be a width of about two fingers between the front of the helmet and your eyebrows. Use the straps each time you wear the helmet, joining the straps at the jaw, under each ear. When you open your mouth, the buckle should be snug but not uncomfortable. Look for a helmet with good ventilation. It will keep you cooler and will encourage you to wear a helmet every time. Choose a helmet with a bright color and add reflective strips to make it as visible as possible. Look for an attractive helmet you will feel good about wearing, so you look forward to wearing it. It’s also important to buy cool-looking and fun helmets for kids, so they look forward to wearing them. You can use stickers to personalize them and make them more appealing, too. If you have been in a bicycle accident, contact Flaxman Law Group for a free consultation. Our legal team has more than 60 years of combined experience and we have already recovered tens of millions of dollars on behalf of plaintiffs in bicycle accident and personal injury claims. Reach out to us if you’d like to speak to an experienced and compassionate Hollywood bicycle accident attorney about your potential claim.